What happened to the internet's greatest hits? In the real world, neglected buildings don't stay intact for long: the windows get broken, the walls get tagged and Mother Nature slowly begins to show them who's boss. Does the same thing happen online? 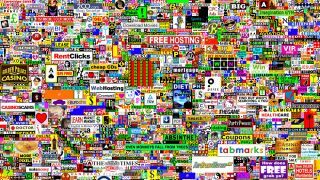 It certainly seemed to in the case of the Million Dollar Homepage, the 2005 hit that made a student a millionaire. Nine years on and link rot means that 22% of its links go nowhere, and many of the links that do work are domain squatters rather than active websites. That got us wondering. What happened to the sites and sights that delighted or frightened us way back when? Are the former viral smashes and hate figures still thriving online, or are they only stars in their own minds? Are people still leaving jokey comments about the Three Wolf Moon t-shirt? There's only one way to find out: fire up the Netscape! This 2003 Flash cartoon swept the Web, delighting thousands and earning animator Jonti "Weebl" Picking a Yahoo! People's Choice Award, which is what the internet had instead of Oscars back then. The badger clip lives on on Picking's personal site Weebl's Stuff, and Picking creates animations for some of the entertainment world's biggest names. Kyle MacDonald started One Red Paperclip in 2005. The titular paperclip was an item he planned to trade, and he would trade whatever item he got for something more valuable until he traded up to a house. It was an early web hit, with MacDonald's trade-ups including a snowmobile, a recording contract and an afternoon with Alice Cooper. The site's still there on Blogspot, but it's long since been superseded by redpaperclip.com, MacDonald's internet and inspirational-speeches company. Colin Miller's film of fish trader Muhammad Shahid Nazir was a viral hit in mid-2012 and led to a chart smash, but Nazir didn't get to enjoy it for very long: he went back to Pakistan in 2012 and has since been indicted by a banking court for defaulting on loan payments. Nazir has promised to return to the UK and resume his musical career, but we suspect that his fish-related fame has probably peaked. The 90s original - cycling colours and animated GIFs delivering an instant headache - is long gone, but tributes live on. Few online hits lead to long-lasting careers - even Tron Guy has a day job - but the ineptly speltHampster Dance is a notable exception: Hampton the "Hampster" has appeared in various children's DVDs and is alive and well on Twitter as @hampsterrific. Various dances are online (via Flash) as a strong reminder of 2000, when the internet was rubbish. Of all the sites listed here, this is the one we'd recommend you don't go looking for. While it hasn't been regularly updated for years, this early example of an online shock site is still functioning and is still packed with things that once seen, you can't unsee. Rotten.com was famous for two things: its content, which featured gruesome injuries and other horrific stuff, and its apparent indestructibility. It was the subject of endless lawsuits and takedown requests, often from grieving families whose loved ones were featured on the site. It sounds odd but Rotten seems rather quaint now: it was driven more by morbid curiosity than any desire to offend, and thanks to cameraphones and video its successors are considerably more graphic and even more upsetting. "Welcome to zombo.com," a man's voice said in mellifluous tones. "You can do anything at zombo.com." If you need proof that the internet can keep even the daftest things alive, this completely useless site - a parody of pointless Flash intros, something late-90s designers were awfully keen on - is still going after fifteen years.